These days, there are several different methods to install carpet, wood, and vinyl flooring. The material may need to be stretched, nailed down, or glued, depending on the unique factors of the process. Ultimately, each floor installation method offers distinct benefits. If you’re in the market for new flooring, you may first want to learn about your options. Most commonly, contractors install hardwood flooring via the nail-down method. The process ensures the wood planks attach securely to the subfloor. Nailing into tongue-and-groove planks effectively hides the nails so that homeowners can enjoy a seamless finish. Hardwood flooring can also be installed with the help of glue. 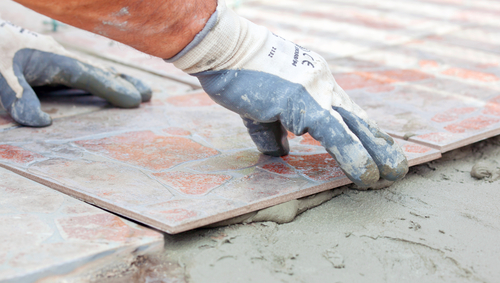 Contractors may occasionally install carpet or tile through this method. Various special glues are necessary to achieve a smooth finish without buckling. As long as the subfloor is sufficiently level and smooth, the glue-down method tends to offer a very straightforward and simple installation process. Technicians have increasingly used an installation process called floating in recent years to install laminate or engineered wood. The contractor pieces several planks together to create a robust floor above the subfloor. Both the subfloor and the additional floor need to be extremely level to avoid warps. The floating method provides additional insulation and comfort for thinner flooring types. The stretch-in method is exclusively used for carpet flooring. It tends to be the most popular method to install carpeting because it ensures the material remains taut to the subfloor. If it feels loose, ripples, or otherwise warps, the contractors did not install the carpeting properly. The experts from Integrity Carpet Care consistently provide the highest standard of floor installations and materials in the industry. From hardwood to carpeting, the Indianapolis, IN, team can handle every project. The team also conveniently tackles steam cleaning and stain treatment for various flooring types. To learn more about the floor installation and carpet cleaning company, visit the website. You can also call a friendly professional at (317) 730-2570.